I had this coffee machine as a gift from my parents from my last birthday. 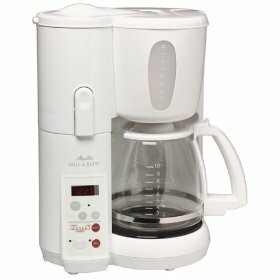 This has been one of my favorite coffee makers since it is very easy to use. But I had to replace two previous coffee machine of the same model. The first two broke in the same place. The plastic part which holds the lid covering the brew basket down has broken (the machine will not work unless the lid is fully closed). Melitta was very good the first time and replaced our pot without charge (six months after purchase). It has been about 18 months this time and we'll see what they do. I hope they won't charge still. But in the meantime I am using a fancy coffee maker which uses juan coffee pods.